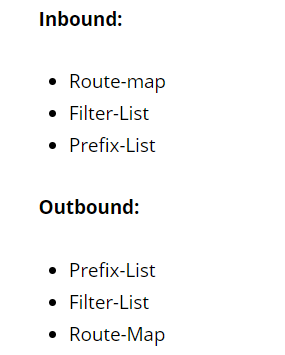 @ReneMolenaar @lagapides have a question concerning the filter-list filtering. This may sound like a silly question. Why did you do the configurations to add AS 11 to the AS path out going 2001:db8:0:1::/64 traffic on R1. Why didn’t you do it on router R2?. Since we are using the neighbor command. Shouldn’t the command be affecting the neighbor router and not the local router. Please, i need clarification. I understand your confusion. When you implement the neighbor command, it is used to create the neighbor relationship. It is also used to configure parameters that pertain to the relationship. But it is never used to configure anything on the neighboring router. Whenever a route map is used in a network command, it always filters the advertisements on that relationship. The in or out keywords indicate which direction is filtered.